Functional yet stylish interior and exterior entrance mats and runners that help maintain a cleaner environment; food service and utility mats for commercial kitchens, bars, serving areas, food manufacturing plants, where durability, grease resistant and drainage are needed. Stylish and tough, these fabric entrance mats compliment any décor while providing scraping and wiping action to prevent dirt and moisture from entering your facility. 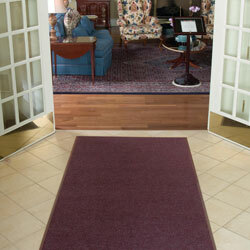 For interior use only, these mats are ideal for entrances, hallways or recessed areas and help prevent additional dirt and moisture from entering your building. Available for indoor or outdoor applications, these mats can be used for hallways, entrances, red carpets events or any floor area that needs protection. 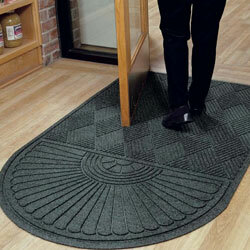 Custom logo floor mats are a great way to advertise and promote your company logo or message. Logos or other designs can be reproduced on the face of the mat. Our custom logo rugs are available in a variety of materials and imprint methods to suit all kinds of applications and placements. All our logo mats are designed for commercial use. Free shipping is offered to one destination only throughout the 48 contiguous United States on all ONLINE logo mats orders. Offer is valid only via UPS standard ground shipping. Free shipping offer only applies to pre-paid orders, for purchase orders or any orders with terms actual shipping cost will be charged. All orders will ship using this method unless otherwise requested. Large and/or heavy shipments will go truck freight and rate can be quoted before order is placed. Orders to Alaska, Hawaii or Puerto Rico will incur additional shipping charges. For our logo mats please allow 5 days to ship out and in some cases 7 to 10 days. Please refer to each individual product page for production time. Please add an additional 2 to 5 days transit time for UPS to make delivery. If you find our same item at lower price somewhere else, we will match it. It's that straightforward. Our Price-match assures you that we will match any like-for-like quote or price published on the Internet. Subject to our terms and conditions below. On top of our Price-match Promise, you will benefit from our Free shipping and our 100% customer satisfaction guarantee. It's simple Order from us ...uy with confidence and get a great deal! Our price-match guarantee applies only to all Logo Mats styles listed on our website. Our price-match promise applies only to other Internet suppliers that offers the identical product (style, color, size and other attributes) and is priced correctly and accurately. To price-match, we must be satisfied that the products in question are identical. Prices can be compared including shipping charges. We offer Free Shipping on all logo mats. Prices are compared excluding Sales Tax (For Florida Customers). We do not price-match with special offers, promotions or discount vouchers/coupons. Our price-match promise is limited to the US territory. We do not price-match Internet suppliers that are based in or operate from outside the US. Any decision whether or not to price-match is at the discretion of Intermats.com. We reserve the right to refuse any price-match request and under no circumstances do we have a legal obligation to price-match. Our price-match promise may be subject to change without notice at any time. How do you go about it? Ask us for a price match simply by informing us of the website where you have seen the item cheaper. If another supplier has provided a better quote, just email us a copy. Make sure you also send us your details (including your name, company name, telephone number and email address). We will then confirm to you our price-match in writing, so you'll have it in black and white for when you're ready to order. Please note that to avoid potential abuse and to enable us to honor our price match promise to genuine customers, the acceptance of any price match request is ultimately at the discretion of Intermats.com. We will at all times act reasonably and in good faith. OUR 100% SATISFACTION GUARANTEE MEANS YOU CAN BUY WITH CONFIDENCE. We offer our customers an amazing unlimited customer satisfaction guarantee. 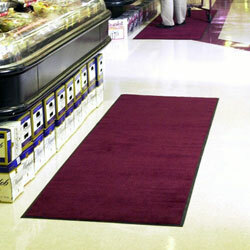 All of the products on INTERMATS websites are designed for industrial applications. If for any reason you are not 100% satisfied with your products, we will replace the mat or refund your money. Contact us on 888-960-1734 or email us during office hours and let us know you wish to return a mat. We will need to know for what reason and your details, name, phone number and the full address where the mat is located. If you know your invoice number, please have this to hand as this will help speed up the process.